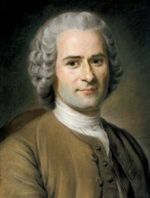 One of the most famous philosophers of the enlightenment, Rousseau's Social Contract explores the foundation of society. Breaking with John Locke's belief in self-evident truths, Rousseau argues that society and law is the product of general will rather than enlightened reason.
" I am not made like any of those I have seen; I venture to believe that I am not made like any of those who are in existence. If I am not better, at least I am different."